Mary Anne here. This summer swelter is stretching straight across the US of A, so I find myself in need of cold comfort. Knowing that the thermometer was on the rise, I loaded up the fridge with a bounty of fresh, crisp fruit and whipped up an old Rittenhouse family summer staple – an enormous fruit salad, which I’ll post next week. Ripe, rosy watermelon was on sale, so I plunked down 6 bucks for one of those fat boys, but it left me with about 3 pounds of unused “meat”. What to do…and then I remembered that last summer, I created a very rewarding Mango Gazpacho and figured I’d take a chance with its blushing cousin. 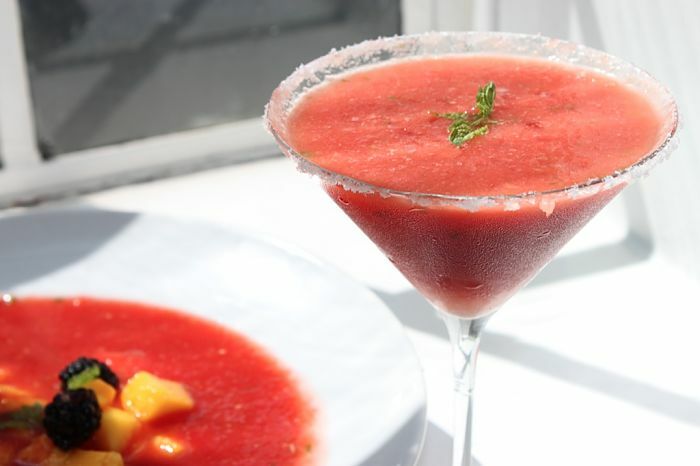 When I first worked up this recipe, I realized that the sweet and zesty flavor of this watermelon “gazpacho” also makes an incredible base for a frozen Daiquiri, blended with a shot or two of rum. And if the cool soup doesn’t make you forget the heat, a couple of Daiquiris just might do the trick. 1. Using a food processor or blender, puree the chopped watermelon. (You’ll need to do this in batches.) Transfer to a large mixing bowl. 2. In a medium saucepan, heat the olive oil over medium-low heat. Sauté the shallots and ginger until pale gold, about 3 to 4 minutes. Add 2 cups of the pureed watermelon to the pot along with the Mirin. Simmer over medium flame, stirring frequently, for about 5 minutes. 3. Transfer the hot watermelon mixture to the bowl of food processor armed with the metal blade, or a traditional blender. Add the Jalapeno, lime juice, and salt. Puree until smooth. Transfer to the bowl containing the remaining watermelon. Stir well to combine. Refrigerate at least 3 hours or overnight. 4. To serve, ladle into soup bowls and garnish with mango slices and blackberries, if desired. Note: This is definitely the kissing-cousin to a frozen Margarita, so I decided to exercise my options and dipped the moistened rim of my glass into some Kosher salt. Sugar would work as well, or just a bare-naked Daiquiri! 1. Combine 1½ oz. rum with ¾ cup watermelon soup in a blender. 2. Add a handful of ice cubes and blend until frosty and smooth. Pour into a large Margarita or Martini glass. Garnish with a slice of lime or a blackberry. This looks WONDERFUL! Regular gazpacho and watermelon gazpacho are both on my “bucket list” of foods to make. I can’t wait to eventually try this, as it looks so refreshing! Thanks! The Daiquiri is really delicious – with or without the rum! I shared some of the soup with a friend who can only tolerate liquids right now, and apparently it hit the spot. I was glad to have something refreshing in the fridge, given the temps outside. Hope you’re in cooler climate. Cheers! love this! Sounds so good right now in the heat of summer! It is so hot out that I’ve been craving cold soups too – this Watermelon Gazpacho will definitely do the trick! That looks so refreshing right now! We spent the day in the pool and I’m exhausted. I haven’t been brave enough to try a gazpacho but I could totally go for a watermelon one! It’s quick and easy and definitely hits the spot if you’re participating in the national heat wave! Hope you have a very cool weekend. Cheers! Pink coolness! The duality of the soup is brilliant! you guys are my new best friends – oh please, oh please, oh please will you move next door? i want, no, make that NEED to have both of these on the menu; at 10:30pm last night, the heat index was still at 100 degrees . . .
Oh, we so hear you. I think I’ve lost 5 lbs. just this week! Try to stay cool – it’s supposed to break in a couple of days, at least here in the east. Hopefully for you as well. In the meantime, Daiquiris anyone? Oh my what wonderful summer time treasures. Can’t wait for the weather to warm up here. Perfect refreshment in either form, right about now. hope you give it a spin! Mmmm, I could go for one of these daiquiris right now! This weather calls for some delicious cold beverages! 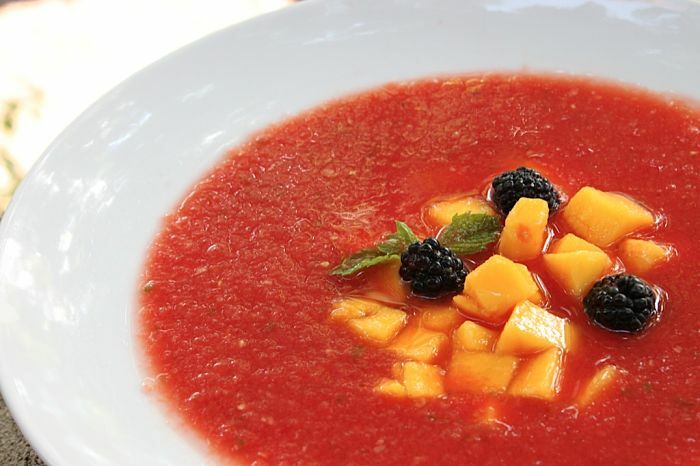 I make both a Watermelon Tomato Gazpacho as well as a Mango Gazpacho, perfect for hot summer days. Now I need to give your recipe a try. A delicious soup turned into a drink ~ a great concept and a great combination of flavors.